At just 320mm tall, the Jonsbo U1 Plus chassis is a great choice for style, practicality and price. It is manufactured from top quality brushed aluminium and really looks the part. The U1 Plus is the predecessor to the popular U1 case, making it the perfect base for home PC systems. The main feature of this case is the timeless design line with the elegantly rounded corners and a very appealing exterior. Another special feature of the case are the transparent window, which is an optical highlight for all hardware enthusiasts who enjoy the view of inside their PC. This refined and at the same time unobtrusive design of the case ensures that it can blend in with any interior style. The blue illuminated power button is recessed into the sleek front. The I/O panel with 2x USB 3.0 and the HD audio connectors can be found on the right side of the case (as seen from the front). The U1 Plus is made of sturdy 4mm thick anodised aluminium with the right side panel sporting a 5mm strong tempered glass. This high-quality and well-manufactures ITX case supports motherboards up to a maximum size of 170 x 170 mm (Mini-ITX). The installation of the motherboard is very simple - after removing the left side panel it can be installed with little effort on the right side panel. The chassis accommodate only Small Form Factor (SFX) power supplies that are installed in the U1 Plus under the top cover. In order to guarantee a particularly smooth-running and at the same time very compact system, Jonsbo decided to leave out mounting options for 3.5 inch HDD. In total, two 2.5 inch SSDs can be installed behind the front of the U1 Plus. Two expansion slots for the installation of a graphics card or sound card is available if required. 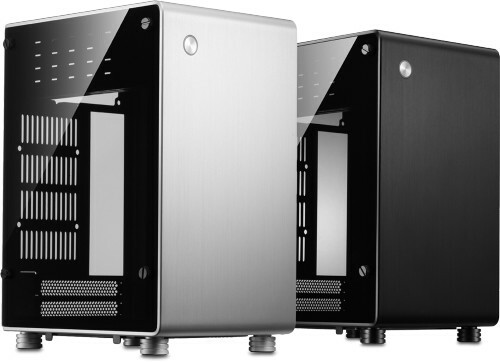 The case is aimed at users who are looking for a very small and stylish PC for typical living room applications. Thanks to the intelligent design of the case, you can install CPU-coolers with a maximum height of up to 133 mm and VGA cards of up to 195 mm in length. It's perfectly suited to house a small Mini-ITX system with a compact VGA card. The ventilation system of U1 Plus is designed for lowest possible noise levels. 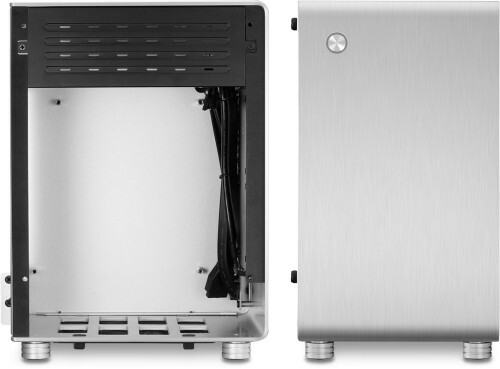 Users can install one 80 mm fan at the rear side of the case to exhaust heat from inside the case. Air intakes in the front of the right side panel allow a continuously heat exchange. The use of aluminium contributes to the improved heat dissipation. The whole case rest on four Hi-Fi looking stylish anti-vibration case feet.